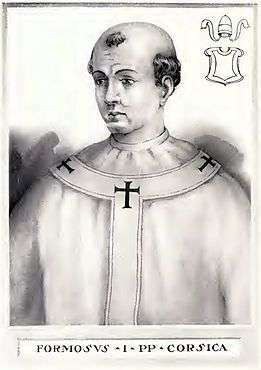 Pope Formosus (birth name unknown; c. 816 – 4 April 896) was Pope from 6 October 891 to his death in 896. His brief reign as Pope was troubled, and his remains were exhumed and put on trial in the Cadaver Synod. Born at Ostia, he became Cardinal Bishop of Portus in 864. He undertook diplomatic missions to Bulgaria (866) and France (869 and 872), and he persuaded Charles the Bald, King of the Franks, to be crowned as emperor by the Pope in 875. As early as 872 he was a candidate for the papacy, but due to political complications he left Rome and the court of Pope John VIII that year. John convened a synod, and Formosus was ordered to return or be excommunicated on charges that he had aspired to the Bulgarian Archbishopric and the Holy See; had opposed the emperor and had deserted his diocese without papal permission; had despoiled the cloisters in Rome; had performed the divine service in spite of the interdict; and had "conspired with certain iniquitous men and women for the destruction of the papal see" . The condemnation of Formosus and others was announced in July 872. In 878 the sentence of excommunication was withdrawn after he promised never to return to Rome or exercise his priestly functions. In 883, John's successor Marinus I restored Formosus to his suburbicarian diocese of Portus. Following the reigns of Marinus, Pope Hadrian III (884–885) and Pope Stephen V (885–891), Formosus was elected Pope on 6 October 891. According to The Catholic Encyclopedia, the vote for Formosus was unanimous. Shortly after Formosus' election, he was asked to intervene in Constantinople, where the Patriarch Photius had been ejected and Stephen, the son of Emperor Basil I, had taken the office. Formosus refused to reinstate those who had been ordained by Photius, as his predecessor, Stephen V, had nullified all of Photius' ordinations. However, the eastern Bishops determined to recognize Photius' ordinations nonetheless. Formosus also immediately immersed himself in the dispute between Odo, Count of Paris, and Charles the Simple for the French crown; the Pope sided with Charles, and zealously exhorted Odo (then holding the crown) to abdicate on Charles' behalf, to no avail. Formosus was deeply distrustful of Guy III of Spoleto, the Holy Roman Emperor, and began looking for support against the Emperor. To bolster his position, Guy III forced Formosus to crown his son Lambert as co-Emperor in April 892. The following year, however, Formosus persuaded Arnulf of Carinthia to advance to Rome, invade the Italian peninsula, and liberate Italy from the control of Spoleto. In 894, Arnulf's army occupied all the country north of the Po River. Guy III of Spoleto died in December, leaving his son Lambert in the care of his mother Agiltrude, an opponent of the Carolingians. In autumn 895 Arnulf undertook his second Italian campaign, progressing to Rome by February and seizing the city from Agiltrude by force on February 21. The following day, Formosus crowned Arnulf Holy Roman Emperor in St. Peter's Basilica. The new emperor moved against Spoleto but was struck with paralysis on the way and was unable to continue the campaign. During his papacy he also had to contend with the Saracens, who were attacking Lazio. On 4 April 896, Formosus died. He was succeeded by Pope Boniface VI. 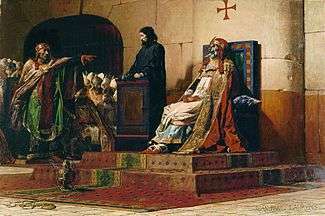 Jean-Paul Laurens, Le Pape Formose et Étienne VII ("Pope Formosus and Stephen VII"), 1870. Note the latter is now called Pope Stephen VI. Pope Stephen VI, the successor of Boniface, influenced by Lambert and Agiltrude, sat in judgment of Formosus in 897, in what was called the Cadaver Synod. The corpse was disinterred, clad in papal vestments, and seated on a throne to face all the charges from John VIII. The verdict was that the deceased had been unworthy of the pontificate. The Damnatio memoriae, an old judicial practice from Ancient Rome, was applied to Formosus, all his measures and acts were annulled and the orders conferred by him were declared invalid. The papal vestments were torn from his body, the three fingers from his right hand that he had used in consecrations were cut off and the corpse was thrown into the Tiber (later to be retrieved by a monk). Following the death of Stephen VI, Formosus' body was reinterred in St Peter's Basilica. Further trials of this nature against deceased persons were banned, but Pope Sergius III (904–911) reapproved the decisions against Formosus. Sergius demanded the re-ordination of the bishops consecrated by Formosus, who in turn had conferred orders on many other clerics, causing great confusion. Later the validity of Formosus' work was re-reinstated. The decision of Sergius with respect to Formosus has subsequently been universally disregarded by the Church, since Formosus' condemnation had little to do with piety and more to do with politics. Bartolomeo Platina writes that Sergius had the much-abused corpse of Formosus exhumed once more, tried, found guilty again, and beheaded, thus in effect conducting a second Cadaver Synod, while Joseph Brusher, S.J. says that "Sergius [III] indulged in no resurrection-man tactics himself" and Schaff, Milman,Gregorovius, von Mosheim,  Miley, Mann, Darras, John the Deacon of Naples, Flodoard, and others make no mention of this story. 1 2 "And it is not unlikely that it was because John VIII saw that Formosus might easily become the tool of designing men or that at least the faction which had secured his interest might cloak their nefarious plans under the good name of the Bishop of Porto that he forbade him to come to Rome again" (Mann & Hollnsteiner 1906, p. ). ↑ "Nor was he [Sergius III] content with thus dishonouring the dead Pope [Formosus], but he drags his carcass again out of the grave, beheads it as if it had been alive, and then throws it into the Tiber, as unworthy the honour of human burial" (Platina 1479, p. 243). ↑ Brusher 1959, p. .
↑ Milman 1867, pp. 287–290. ↑ Gregorovius 1903, pp. 242–248. ↑ Mosheim 1852, pp. 120–121. ↑ Miley 1850, pp. 269–281. ↑ Mann 1910, pp. 119–142. ↑ Darras 1898, pp. 560–564. Milman, Henry Hart (1867), History of Latin Christianity, III (4th ed. ), London: John Murray, pp. 287–290. Friedrich Wilhelm Bautz (1990). "Formosus, Papst". In Bautz, Friedrich Wilhelm. Biographisch-Bibliographisches Kirchenlexikon (BBKL) (in German). 2. Hamm: Bautz. cols. 70–71. ISBN 3-88309-032-8.